This is a short and easy off-trail hike that you can do if the upper Pinaleno Mountains are snowed in. There is a lot of history in this pretty riparian area. From the Ladybug Trailhead, begin following the Ladybug Trail #329 up the brushy ridge away from the parking area. 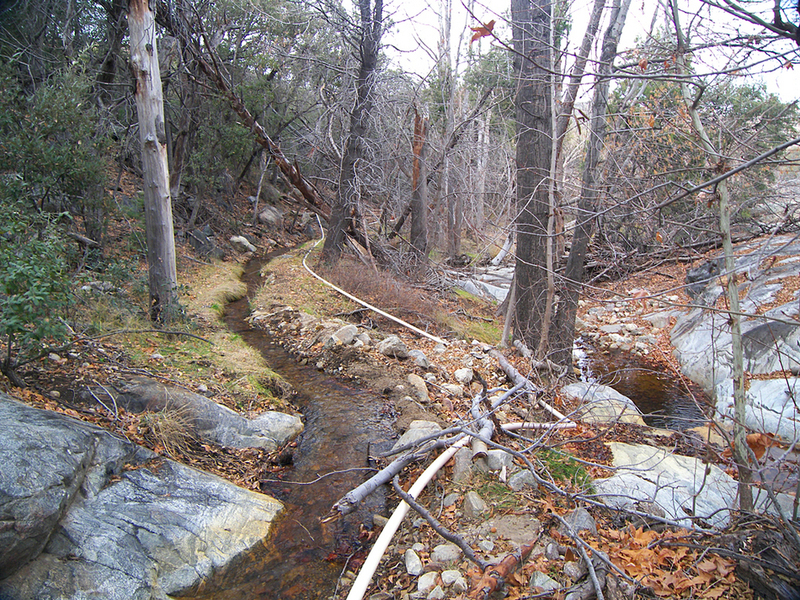 This is believed to be the route of the old Jacobson Sawmill road, built in 1894 to access the sawmill that was located higher up in the canyon near the Turkey Flat cabins. The trail soon turns left, leaving the old wagon road. The Ladybug Trail begins heading downhill towards the creek, and soon crosses an irrigation ditch on the side of the hill. This ditch provides Angle Orchard (near the Ladybug Trailhead) with water. Turn right, and begin following the little irrigation ditch upstream. Be careful not to damage the ditch when hiking beside it. Follow the route of the ditch along the hillside, as it makes a pleasant stroll through the alligator junipers and oak trees. The footing on this route can be a bit tricky, as there are two small plastic and iron pipes that snake along the ditch among the grasses. The ditch has its own man made riparian area, complete with a small raspberry patch. Soon perennial flowing Jacobson Creek rises up to your left to meet the ditch, in an area of alder trees and sycamores. There is a short waterfall just upstream of where the ditch meets the creek, and a worn trail heads up the bank to the right of it. At the top of this bank is the area shown on the topo map as Adams Flat, which is covered in a pure stand of white oak trees. The old Jacobson Sawmill wagon road rejoins us here, although its route has long since succumbed to the vegetation. There are a few ponderosa pines and young white firs scattered around here. Heading back to Jacobson Creek, a short walk down the creek bed will take you to a couple waterfalls where the creek passes through a deep crack in the earth, and drops about 50 feet in a short distance. 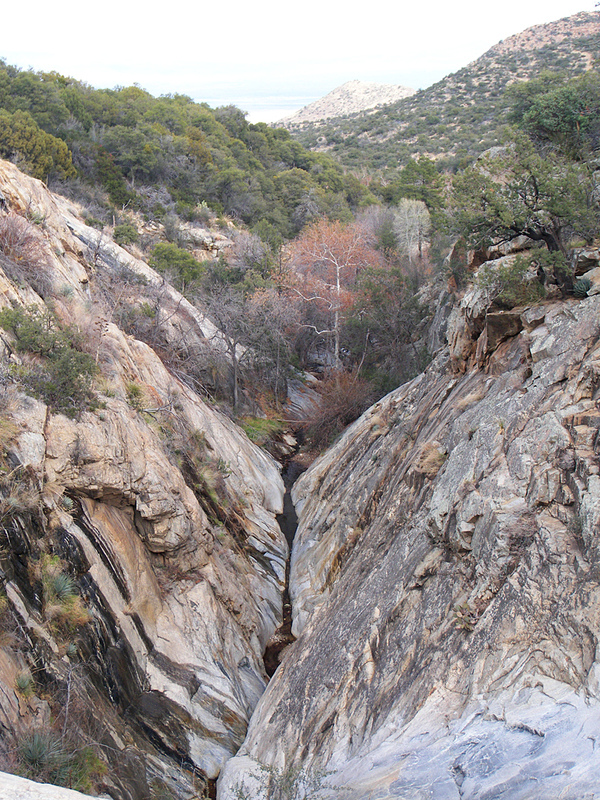 The short, cascading waterfalls slide over the polished, gray granite bedrock here, next to a flat sitting rock. There is a hot tub sized pool at the base of the upper falls. The rock around it is slick, so be careful if you choose to get in. One can enjoy looking down the perfectly straight cleft in the bedrock here, to the desert in the distance. When you are done, head back down canyon, following the flume. If Angle Orchard (which has been operating since 1922) is open, and there is fruit to be had, get some. Probably the best tasting apples I've ever had! From US highway 191, follow highway 366 approximately 7.5 miles to Angle Orchard/Ladybug Trailhead road (forest road 4515). Follow forest service (dirt) road 4515 about 0.5 miles to the Ladybug Trail sign.